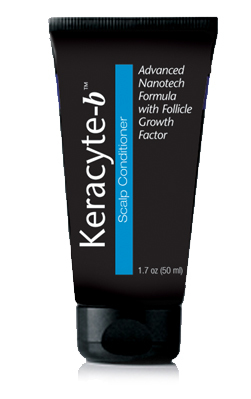 Keracyte-b Scalp Conditioner 60 days supply 1.7 oz 50 ml $98. DermaPlus personal care product are based on the use of genomics. Dermaplus’ mission is to design and manufacture sophisticated, high performance biomaterials for use in the cosmeceutical and personal care markets. The design of these materials is based on human genetic sequences, and can be customized to reflect the genetic makeup of human tissues, population groups or even single individuals. The Company is using proprietary technology to design and manufacture personalized biomaterials that have performance and marketing advantages over existing materials. DermaPlus focuses on primary anti-aging cosmeceutical products, incorporating the tissue regeneration applications of its proprietary technology. The basic genetic database of human biopolymers that give strength and elasticity to the lung, arteries, skin and other tissues can be accessed from the Human Genome Project. The Company will supplement this information extensively with a collected private database of genetic sequences from human tissues. This private database will guide the design of customized biopolymers such as elastin to increase their performance, strength, utility and appeal. To manufacture the desired polymers in quantity, their design is incorporated into custom synthesized DNA and the DNA introduced into green plants, such as alfalfa. The plants read the introduced DNA and make the designed polymer in the plant tissues in amounts of up to 1 gram per Kg dry weight of plants. The plants are cultivated hydroponically, harvested and the polymer extracted. Sophisticated custom designed and manufactured biopolymers such as those developed by Dermaplus are currently not in personal care ingredients. Keracyte-b is a scalp conditioner that stimulates the hair follicles with a special protein / peptide formulation in order to restore the vitality of your hair, enhance your self-confidence and restore your youthful appearance. Results may vary from individual to individual. Not indended to treat or diagnose any disease. Thanks to Keracyte’s follicle stimulating component, your hair follicles become stronger and more resilient, allowing them to better function as intended. Good Scalp Maintenance leads to Healthy Hair. Receding hairlines, bald spots, or male pattern baldness can be devastating to your appearance and confidence, but they don't have to be! The ingredients in Keracyte-b are key in maintaining a healthy and vibrant scalp. Keracyte-b will help your hair shafts grow longer, thicker and with more of your original color, and help you maintain the appearance of a full head of hair. Keracyte-b has a mechanism of action that is completely different than any FDA approved hair loss drug. The exclusive protein/peptide complex in Keracyte-b stimulates and nourishes your hair follicles to grow larger with more hair producing and more color producing cells. The unique amino acid/mineral complex is a potent anti-oxidant that protects your existing cells from the destructive effects of exposure to UVA/UVB rays and DHT. Whether you use Keracyte-b by itself or in concert with other products, you will see a difference. Try it Risk Free! Buy it. Use it for 60 days and if dissatisfied return any unused product for a refund. Its never too early to start caring for your scalp! Who would have thought a simple scalp conditioner could restore your hair's original color while also making it thicker and stronger? Thanks to Keracyte's follicle stimulating component, your hair follicles become stronger and more resilient, allowing them to better function as intended. Follicles are a collection of skin cells that nurture hair growth. Operating together almost like a knitting factory, they team up with sebaceous (oil-producing) glands, keratinocytes, and melanocytes to produce hair. Keratinocytes are cells that produce the protein Keratin, a strong and fibrous protein that makes up the hair, nails, and skin. Through the growth process, keratin is knitted into the hair shafts. When Keracyte is introduced, hair grows back stronger and thicker. The cells known as melanocytes are responsible for hair color. These cells produce and contain the pigment known as melanin, which gives us coloring in our skin, eyes, and hair. In response to Keracyte, these cells begin to once again produce your natural hair color. Keracyte' s work on hair follicles becomes noticeable upon emergence of new hairs, i.e at the end of the telogen phase of the hair growth cycle and upon commencement of anagen phase. This resting phases (catagen and telogen) can take up to 7 weeks. Keracyate does not have any affect on existing hair shafts. The active ingredients act to rebuild the degraded hair follicles by strengthening the matrix proteins (the material between the hair producing cells) and also by attracting new hair producing cells (keratinocytes) and color producing cells (melanocytes). As a result of Kercyte's ingredients, when gray hairs fall out they are replaced after the resting period with hair that is both thicker and closer to the original color. Your own results will be a function of the length of your growing cycle (anagen phase). The anagen phase can be 2 to 6 years in length with about 10-15% of your hair in the resting phase at any one time. So that noticeable changes in hair color will take some time and will vary between individuals. The before and after photographs below are of a scalp treated with Keracyte, two times a day for five weeks. Hair becomes grey because specialized cells within the hair follicle called melanocytes stop making melanin, the pigment responsible for giving hair its color. The pigments eumelanin colors hair brown or black and pheomelanin results in yellow and red hair. As the hair follicles gradually stop making melanin and incorporating it into the hair shafts, the hair turns grey and then white. Until recently, scientists had no idea why hair follicles stopped making melanin, causing grey hair. It has been proposed that the formation of melanin itself may contribute to loss in pigmentation because melanin synthesis causes the release of reactive oxygen species that harm the melanocytes. In a Science magazine report, researchers from Dana-Farber Cancer Institute and Children's Hospital Boston say they have found the basic cause of graying hair while investigating the origins of skin cancer1. These scientists discovered that there is a gradual depletion with age of the stem cells that are the precursors to melanocytes in the hair. These stem cells normally give rise to melanocytes during the hair's grow-andrest cycle and then migrate to the bottom of the hair follicle and add color to the keratinocytes in the hair shaft. The scientists speculate that hair graying may be caused by the programmed cell death (apoptosis) of the melanocyte stem cells caused by the stress of changes (such as dormancy) in the hair life cycle. Some of the stem cells, instead of coming out of dormancy, just die instead. A method of preventing graying or restoring hair color must address this loss of stem cells to be a permanent or long-term solution. Treatments that help protect stem cells against apoptosis, such as the Bcl2 gene product, or molecules that help nourish and stimulate stem cells during their awakening from dormancy may help address the loss of hair pigment with age. The loss and thinning of hair is a troubling experience for many men as they age, and even for some women. Male pattern baldness can begin in early adulthood for a few individuals, and leads to the eventual complete loss of hair except for a "fringe" around the sides of the head. The causes of hair thinning are more diverse than most people realize although much attention has been focused on the activity of testosterone and dihydrotestosterone (DHT). Testosterone and DHT are known to be factors in male pattern baldness, but many men have high testosterone metabolite levels and never suffer from male pattern baldness. Some suggest that a combination of factors, including a person's genetic background and the impact of the environment are responsible for hair loss and thinning. What is known is that in some men, DHT causes an increase the length of time that the hair follicles are dormant, producing thinner, slower growing hair. The most widely used hair loss treatment, Rogaine®, does not block DHT or its activity. This drug stimulates production of the hormone Vascular Endothelial Growth Factor, and increases the vascularization (blood flow) in the dermal pappila. Hair follicles in the scalp are intimately associated with and responsible for the production of scalp proteins such as elastin. The elastin fibers in the upper dermis are exclusively synthesized by the cells lining the root sheath in the hair follicle2. This establishes an intimate connection between the hair follicles and the extracellular matrix that supports the follicles in the skin. There is growing evidence that other factors affect thinning and loss of hair, including damage to the proteins in the scalp from sunlight and also environmental conditions. This is a self-reinforcing problem, because as hair thins and becomes more sparse, greater amounts of sunlight, in particular in the UV range of the spectrum, can penetrate to the scalp and damage the proteins in the scalp matrix. For example, there are significant differences between the elastin in the scalp of infants compared to adults. Figure 1 shows an elastin-stained section of skin from the scalp of a human infant, displaying organized bundles of elastin associated with the hair follicle3 (HF). Figure 1. Follicle-associated elastin in the scalp of a human infant. It is readily seen from these Figures that the elastin is both closely associated with and produced by the hair follicles themselves. The synthesized elastin forms dense, well organized bundles running through the epidermis and deeper into the dermis (Figure 2) in the scalp of infants. Figure 2. 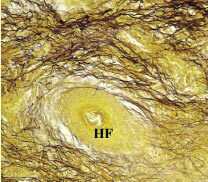 Cross-section of elastin fiber organization in the scalp from a human infant. Solar damage to elastin in the scalp of adults (solar elastosis) interferes with elastic fiber interactions with each other and with hair follicles, and may be a major contributor to hair thinning and loss (Figure 3). Sections of adult scalp show extensive elastin damage and loss of organization, presumably due to UV-induced changes in the elastin proteins themselves. These figures show a marked change in the elastin in the skin of adults compared to infant scalp skin. Figure 3. Section from adult scalp tissue showing hair follicle and elastin fibers. Not only is elastin and its precursor, tropoelastin, synthesized by the cells in the hair follicles, but the follicles themselves appear to depend on elastin and the structure of its matrix for their function and vitality. A genetic defect in humans termed Menkes' syndrome results in deficient uptake of dietary copper. Copper is essential for the enzyme that crosslinks elastin in the extracellular matrix, so sufferers of Menke's syndrome show abnormal arteries – arties have very high elastin content – progressive neurological deterioration and early death. Another effect of Menke's syndrome is brittle, fragile and sparse hair, suggesting that the elastin structure in the scalp is important for normal hair follicle function and hair structure. Further support for the idea that elastin structure in the scalp is linked to and supports hair growth is provided by a mouse genetic model called rough coat5. Mice with the rough coat genetic defect have significantly reduced levels and altered deposition of both elastin and collagen in their skin and internal organs. Rough coat mice also display progressive hair loss – similar to male pattern baldness in humans. These observations strongly suggest that elastin is both synthesized by and essential for the complete functioning of hair follicles. Elastin damage by aging processes and sunlight contribute to the loss and thinness of hair as we age. One method of restoring elastin lost during aging would be the use of a small molecule that stimuates the body to synthesize more tropoelastin. No safe and effective molecules yet been found that stimulates elastin synthesis in skin. Another approach is to provide human elastin to the scalp in a formulation from an outside source. Human elastin is known from clinical trials to penetrate the skin on the face and become absorbed. We have recently evaluated the topical application of human tropoelastin, the precursor to elastin, to the scalp of a volunteer showing the signs of male pattern baldness. If damage to the structure and matrix of elastin in the scalp contributes to the thinning and loss of hair, then providing an external source of this human protein could help reduce ongoing hair loss and stimulate new hair growth. Elastin is the protein in the extracellular matrix surrounding the skin, organs and connecttive tissues that gives these materials their strength and elasticity – it is the "rubber band" that causes our skin and other organs to maintain their shape and "snap back" if they are stretched. Elastin is produced almost entirely during development and early childhood – little or no elastin is made by adult tissues. Elastin is a major protein component of arteries and veins – About 30-50% of the aorta, 50% of elastic ligaments, and 2-5% of the skin are made of elastin. Elastin deficiencies cause certain diseases – elastin loss in major blood vessels leads to atherosclerosis and elastin loss in the lung leads to emphysema. Elastin is extremely durable in skin – it has a half-life of about 70 years, but is only slowly replenished. The skin gradually loses its elastin content over time, with about 10% of the elastin content of the skin lost over a lifetime. Elastin loss leads to decreases in the flexibility, strength and healing ability of skin; eventually thin, sagging and easily injured and bruised skin results. Elastin loss also leads to a reduction in the vitality of hair follicles in the scalp. Tropoelastin is the water soluble precursor to elastin. Tropoelastin is the form of elastin made by the cells in the body. This elastin precursor is then exported outside the cells and becomes incorporated into the extracellular matrix as elastin. Elastin promotes wound healing and tissue regeneration; it has been used as a coating on collagen patches for injuries, tissue augmentation, as part of a gel or scaffold in wounds, and elastin helps recruit the cells that regrow new flesh to the site of a wound. Keracyte contains Elastatropin, a form of the human elastin precursor tropoelastin. It is made by inserting the gene for human elastin into plants and microorganisms. The human elastin is recovered from the cultures, purified and formulated into a skin care product. Elastatropin is much more available to the skin and active on the skin’s surface and scalp than traditional forms of elastin, which is usually derived from animal sources. Laboratory studies have shown that some forms of human elastin (including the elastin in Keracyte) can penetrate into the surface of the skin, and become incorporated into the extracellular matrix surrounding the skin cells. Keracyte-b contains about 50 ug per ounce of human tropoelastin. This is a sufficient amount to replenish the elastin lost from the scalp in about one month. The addition of an active form of elastin to the skin’s surface has the potential to reduce the requirement for drugs or cosmetic surgery procedures, making it a highly cost effective and safe alternative. Keracyte contains as active ingredients: Tropoelastin, Hyaluronic Acid, Argireline, and Matrixyl-3000. The actives in Keracyte are at much higher concentrations than used in most skin and hair care compositions. Keracyte-b is the only product known to contain active molecules such as Human Tropoelastin. As first discovered with DermaLastyl-β, the active ingredients can effectively reverse wrinkling and decrease the onset of various signs of aging. Unexpectedly, the same ingredients in Keracyte-b has been found to produce another age-defying result. When applied directly to the scalp, Keracyte-b creates a thicker and healthier appearance of hair. When introduced into the skin and scalp, Elastatropin® Follicle Stimulating Factor helps increase the amount of elastin contained in those regions. This increased elastin aids the body in preventing wrinkles and in healthier hair follicles, which ultimately results in healthier, thicker hair. Q: How does Keracyte work? A: Studies show that elastin structure in the scalp supports and nurtures hair growth. Keracyte contains Tropoelastin, the human form of elastin, which has been shown to reduce hair loss and even aid in the growth of thicker hair. When applied to the scalp, Keracyte introduces Tropoelastin to the hair follicles, rendering them healthier and stronger for better functioning. Q: How do I apply Keracyte? A: Keracyte should be applied directly and massaged into the scalp, ideally twice per day. Q: How much Keracyte do I need to use? A: We recommend applying a small dab of Keracyte, about the size of a nickel, and massaging it into the scalp. Q: Will Keracyte work for women too? A: Keracyte was not designed specifically for one gender over the other. Women are encouraged to use Keracyte as well, if needed. A: Keracyte should produce results in about three to four weeks of consecutive use. Because everyone’s body is different, not everyone will see the same results in the same timeframe. Q: Does everyone see results? A: Everyone may not notice the same results. Q: If I’m not satisfied, how do I get a refund? A: To process a return or refund, please return your purchase within 60 days. Mechanisms of Hair Graying: Incomplete Melanocyte Stem Cell Maintenance in the Niche. 2005. Science 307: 720-724. Starcher, B., Pierce, R. and Hinek A. 1999. J. Invest. Dermatol. 112(4): 450-455.